Get started with Office 2011 for Mac and discover the creative possibilities The leading suite of productivity software for the Mac, Microsoft Office helps users complete common business tasks, including word processing, e-mail, presentations, financial analysis, and much more. Get started with Office 2011 for Mac and discover the creative possibilities The leading suite of productivity software for the Mac, Microsoft Office helps users complete common business tasks, including word processing, e-mail, presentations, financial analysis, and much more. 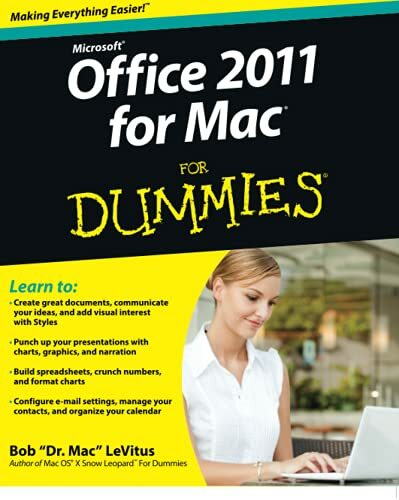 Office 2011 for Mac For Dummies is the perfect companion for Microsoft Office for Mac users upgrading to the newest version, new computer users, and those who may have switched from the Windows version of Office. Written by one of the most popular gurus in the Mac community, Bob "Dr. Mac" LeVitus, the book explains every 2011 application so you can become savvy in no time. * Addresses ways to refine and edit documents with Word * Explains how to add pizzazz to your slide shows with PowerPoint * Guides you through crunching numbers and data with Excel * Demonstrates how to send, receive, and manage your e-mail on Outlook * Encourages you to organize your contact information, schedule your time, and more With Office 2011 for Mac For Dummies, you'll learn everything you need to know to make the most of Office on your Mac!